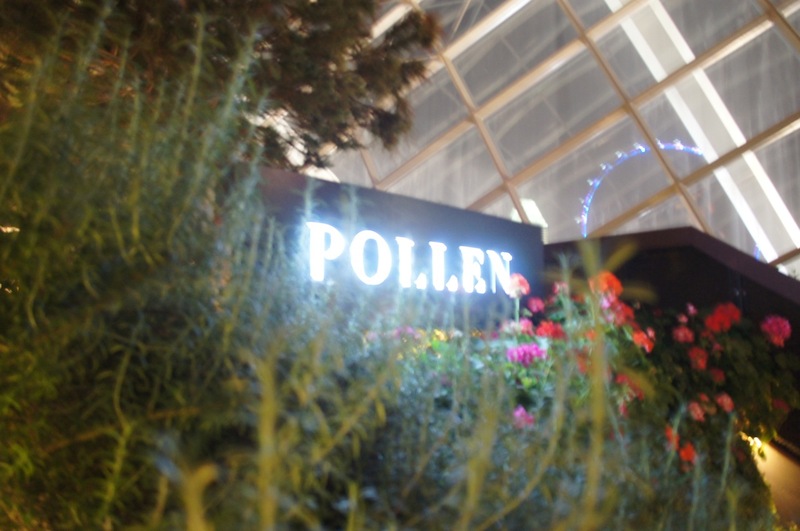 Pollen at Garden by the Bay, Jason Atherton’s spin-off in the Lion City, extended the Mediterranean-influenced, French Fusion-styled cuisine that Pollen in London was famous for, and gave it a local twist. Besides that flower-theme, it also has dessert bar that featured an ex-E Bulli chef with some really molecular dessert creations. 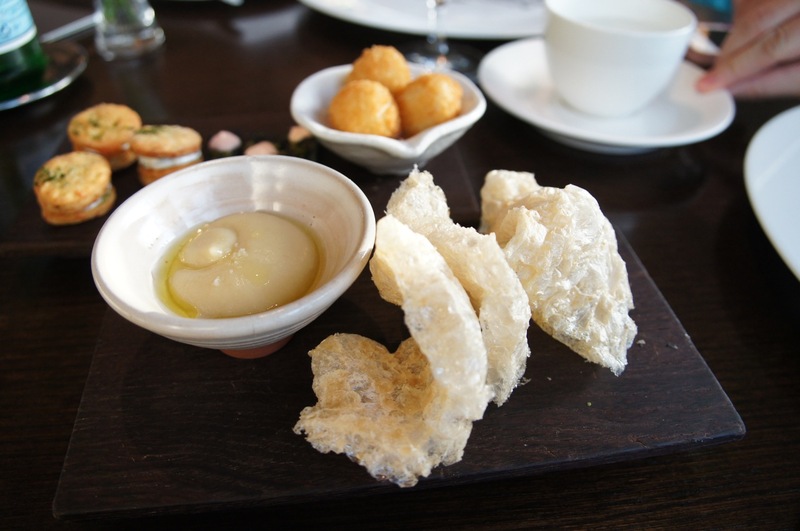 We visited the restaurant on their first anniversary and tried their Anniversary Tasting Menu (and a few from the a la carte). 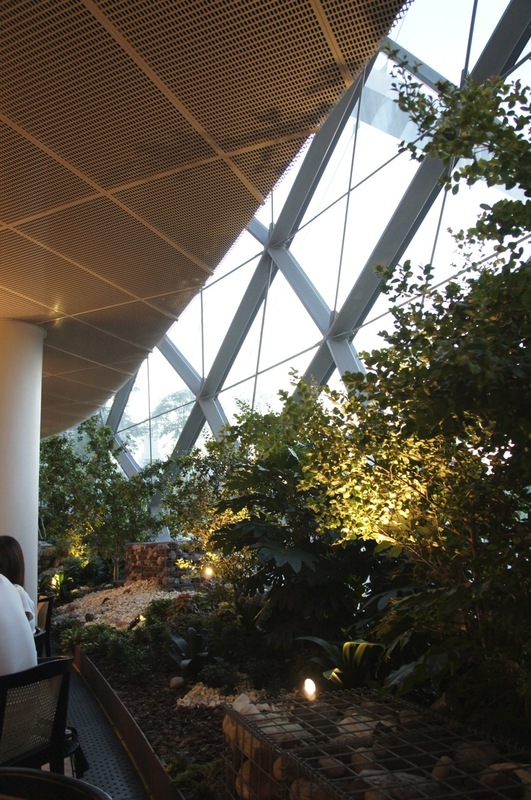 Located inside one of the glass domes garden of Gardens by the Bay (Flower Dome), you get to visit the dinner after dinner using the private lift in the restaurant. 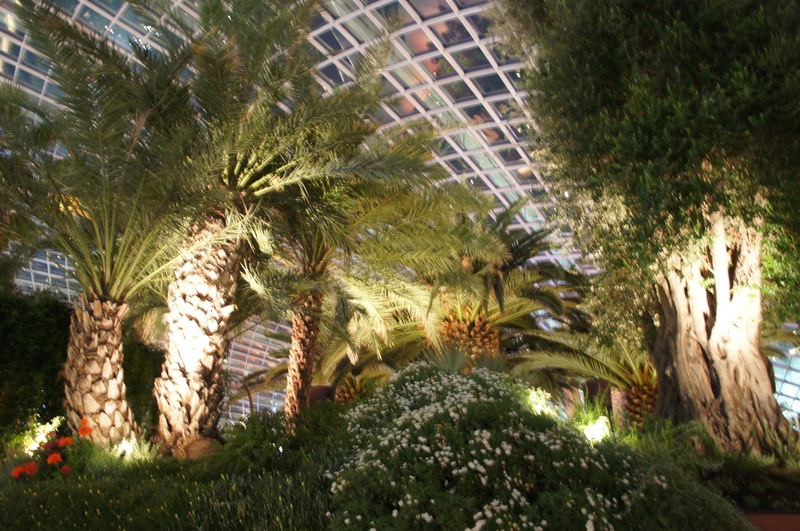 So go for the first sitting, and you will still get a chance to walk a bit of the flower dome for the remaining time. You arrived at the visitor centre, and then there’s a free Pollen shuttle waiting under the super trees to bring you to the Main Entrance. Of course you can walk through the hot and humid evening of Singapore tropical weather or you can take the free shuttle and arrive in style, up to you. For me, we took the latter. 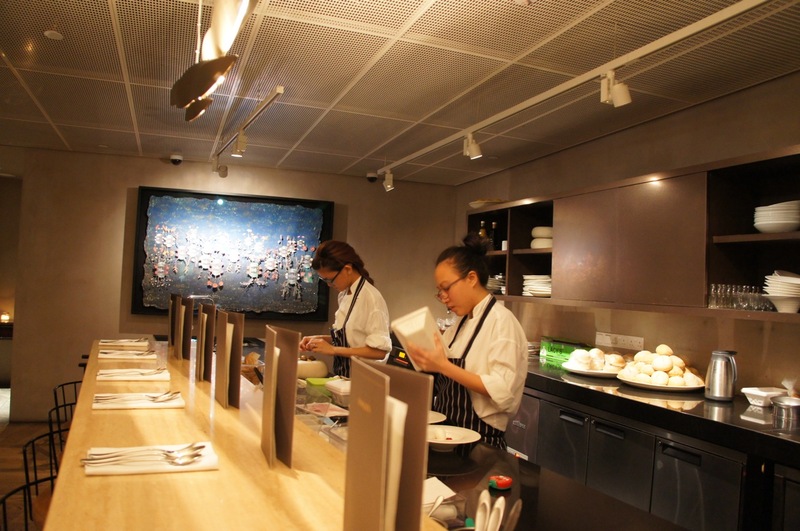 Pollen has their own dinner service specially made – which explain the $190++ for the 7-course Anniversary tasting menu (excluding the amuse bouche, which you will see later, was a course by itself), and that’s before the wine pairing. 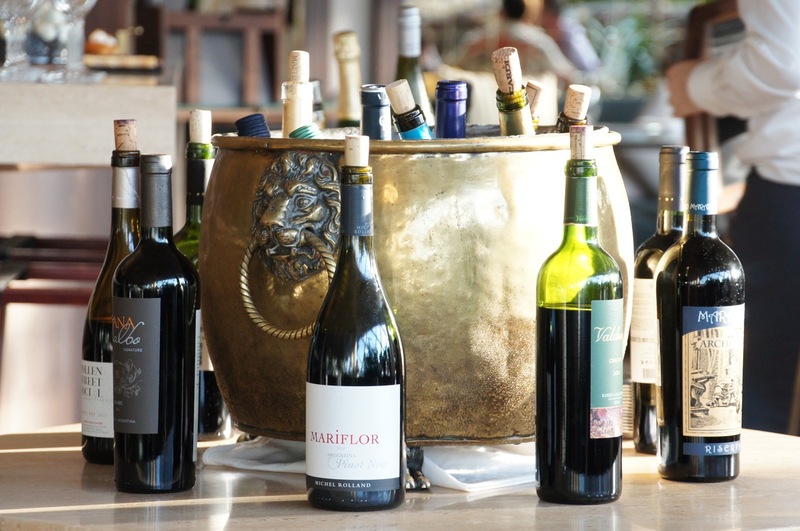 Every course was paired with a vintage, and that on top of a great selection of house pours. Actually, they were all vintage and paired with the menu. 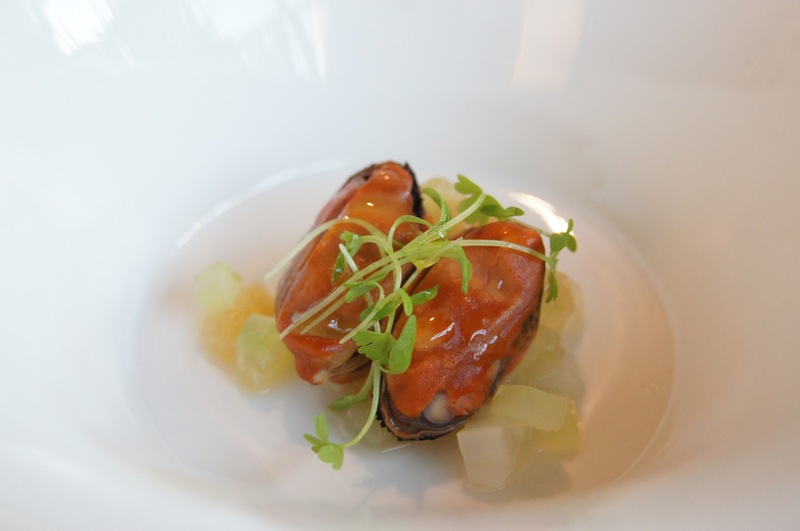 The amuse bouche did not disappoint. It was made up of 4 different parts, representing the seasons(?). First, a cream puff pastry with spiced salt. 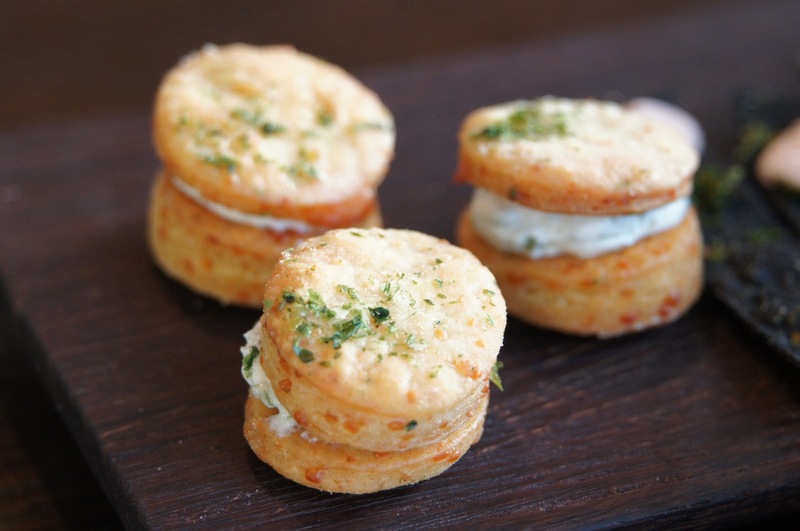 The pastry was like cracker thin and the savoury cream complimented pastry like a slaty macaron. 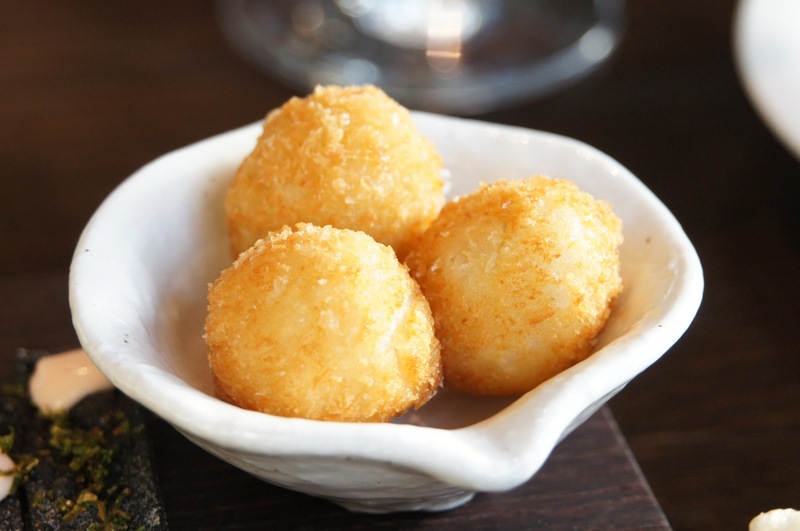 Next, a potato hash ball which was light and fluffy mashed potato balls with a crispy skin. Made you rethink McD hash browns completely. My little princess cannot look back anymore. 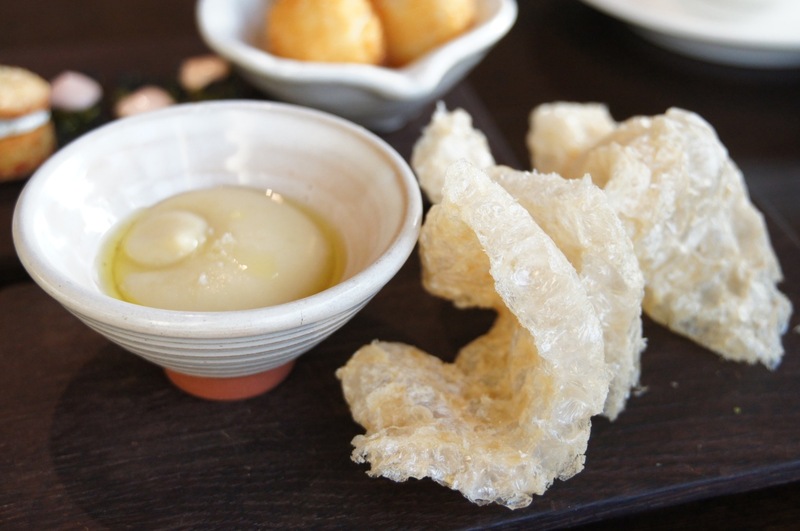 Then it was a familiar taste, which was a deep fried pig skin (YUM!!) with a homemade mayo sauce. The girls did not like it until I told them the collagen content. 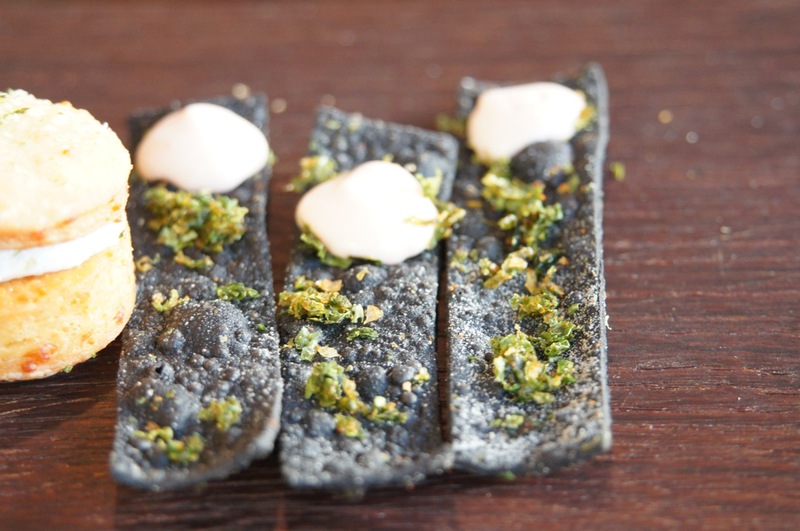 The piece de resistance was the Nori cracker with that little bit of mayo sauce. Wow. 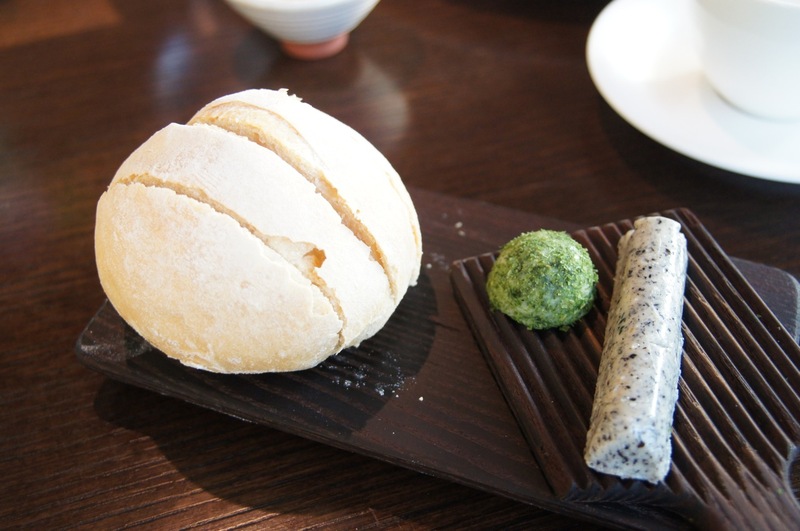 Seaweed was featured quite a bit during the dinner, with a Wakame butter that was served with the dinner roll. The butter was so good that we order a al carte for tomorrow’s breakfast and it was $24 for 2 portions. If you come across this at Pollen, eat your heart’s fill. It was good stuff. 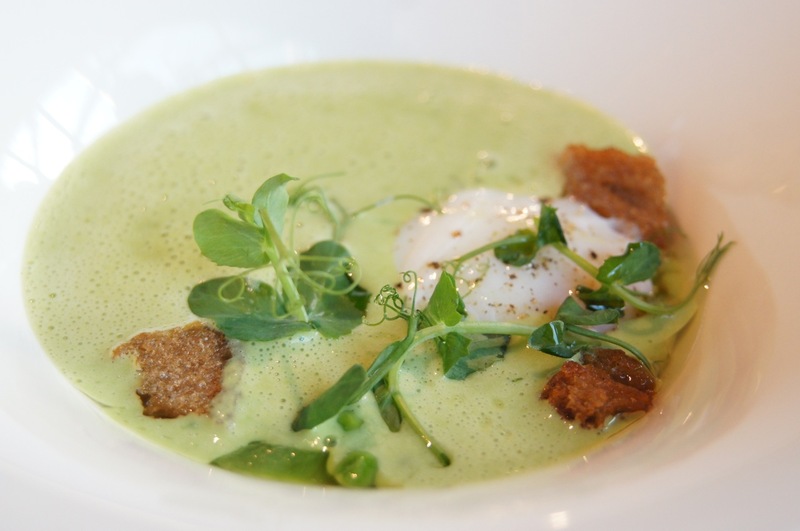 We ordered an a la carte soup – Pea Soup with Onsen Egg and Sourdough Croutons. 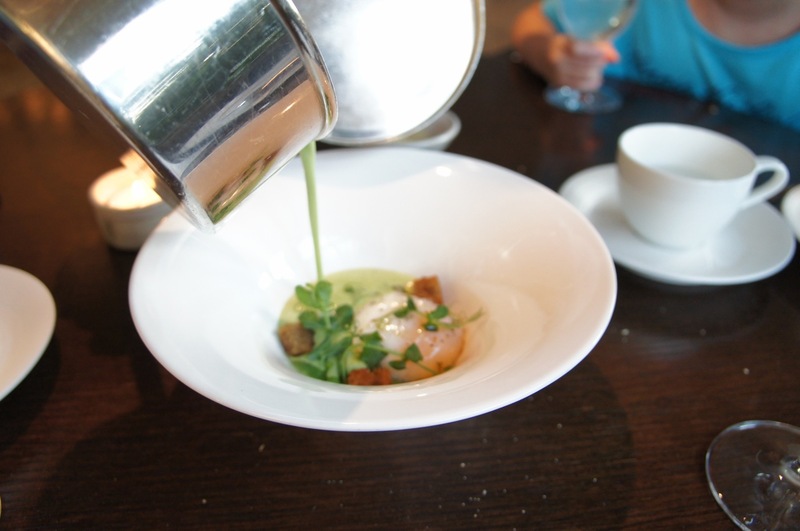 The pea soup was delicate and not overpowering with the “beany” taste. Dashed with a bit of DouMiao (Pea Shoots), the soup was not what we expected of the pea soup. Actually, we did not know what to expect, because it was not the vegetarian variety that we were used to. 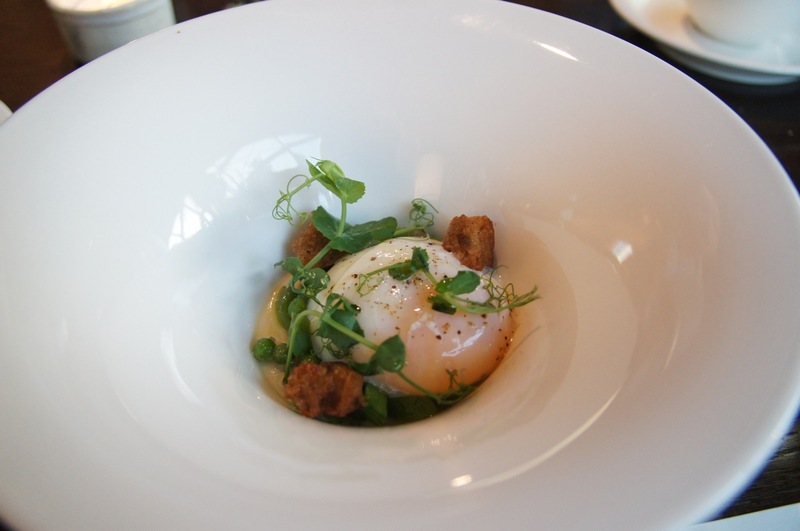 But the perfect Onsen-style egg gave it the depth. You need to put in a pinch of salt and then it will become a morning breakfast favourite. 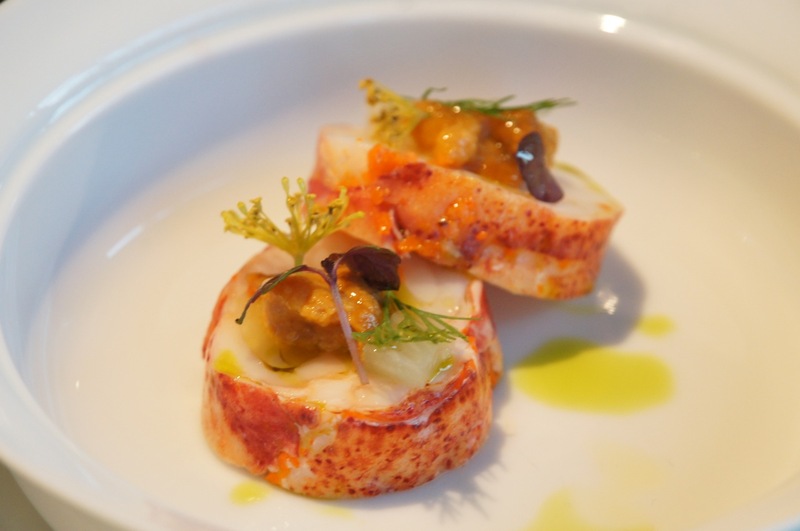 Another a la carte menu item – Boston lobster, fennel, cashew nut, tamarind, grapefruit. 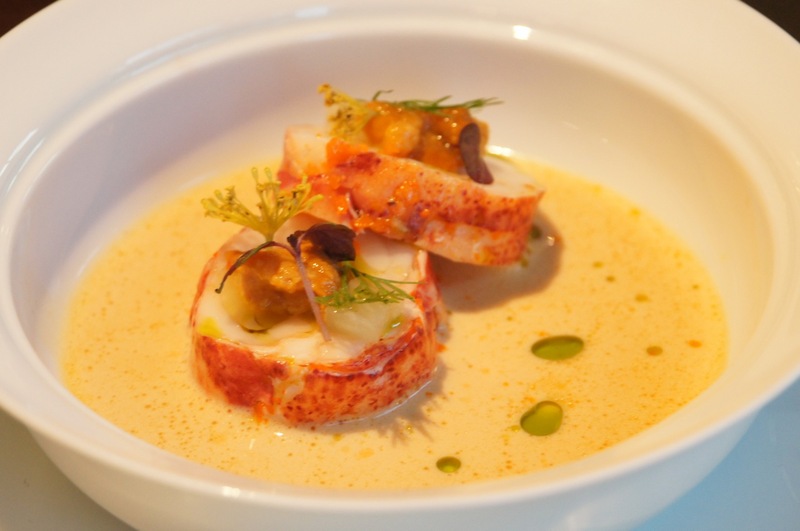 In English, 2 cuts of the lobster tail, served with fennel and cashew nuts sprinkling, on a tamarind sauce. Ok la. 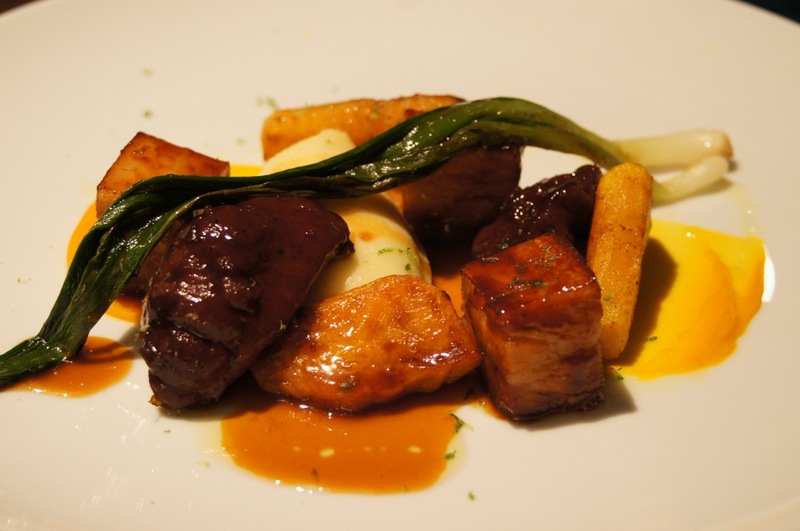 A main course from the a la carte menu – Kurobuta pork belly, red cabbage gel, pineapple in sherry vinegar and black pepper caramel. Now for the first course of the tasting menu titled “Wild Fennel”. 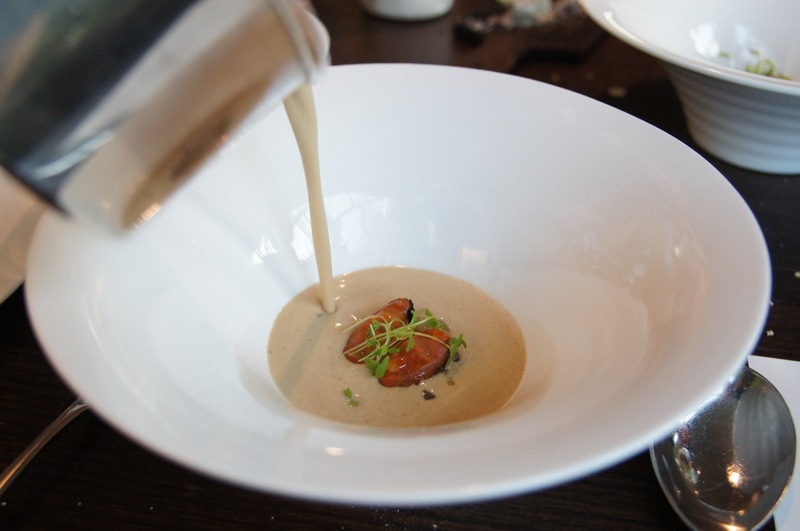 More accurately, it was a Blueshell mussel soup, sea herbs and wild fennel made into a bisque style. The warm soup was pour at table side that gave it a visual presentation of the actual ingredients before fully submerged into the soup. 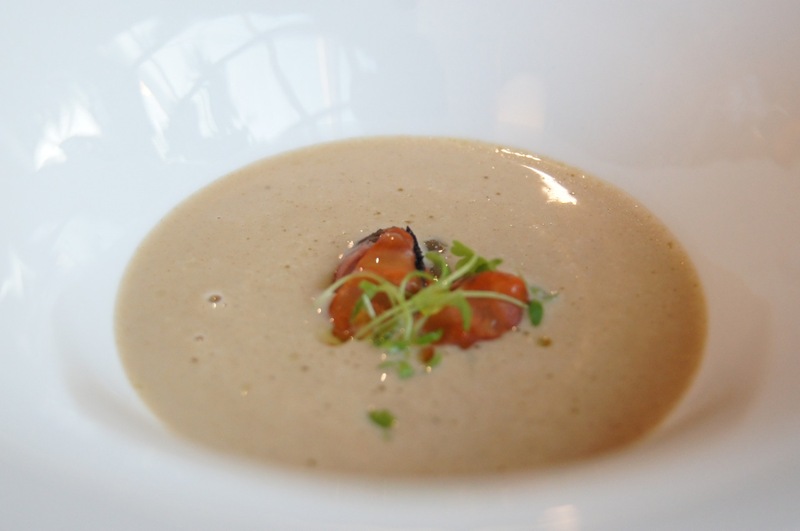 Delightful texture, with a rich creamy bisque and chunks of fennel and mussel. But the mussels were really small. 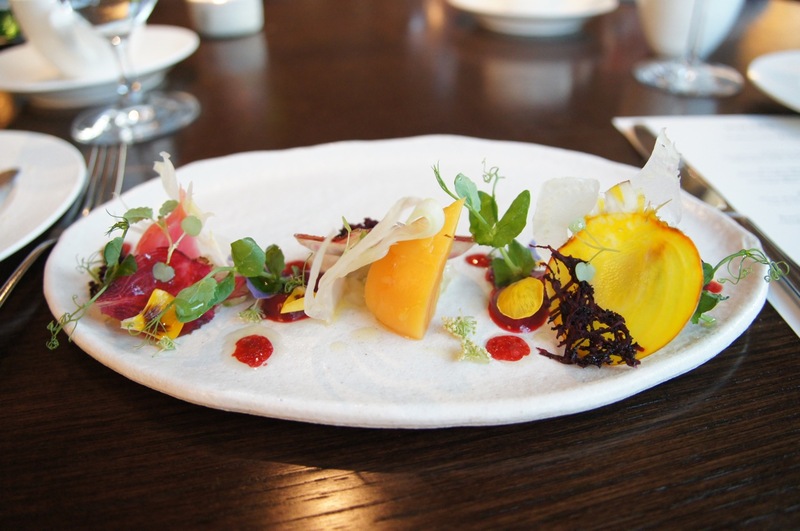 Next, titled “Pollen from the Gardens”, a salad of Hokkaido scallop tartare, sudachi lime, baby beets, oyster emulsion, pollen from the garden. Frankly, it was visually stunning. But where’s the scallop? Oyster emulsion? What’s sudachi lime? Wah lao (Singlish, OMG), like eating flowers. 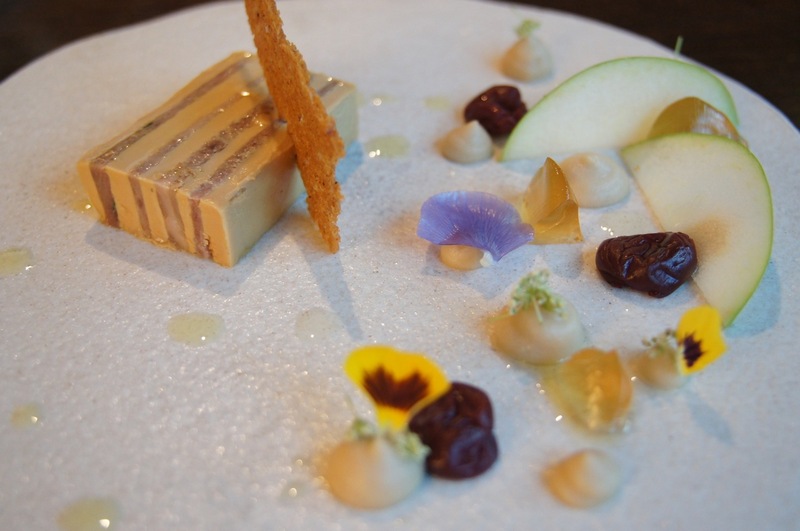 “Blooming Flowers” was a mosaic of foie gras and confit duck with edible flowers. 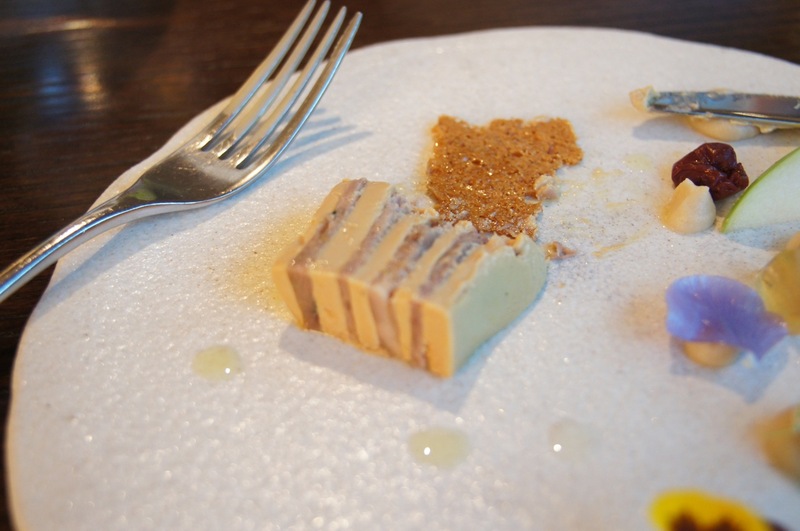 The “kueh lapis”-like cake was the mosaic with interwoven layers of foie gras and duck meat. The mosaic was delicious, but in terms of titles, the previous dish was more like Blooming Flowers, and this Kueh Lapis. 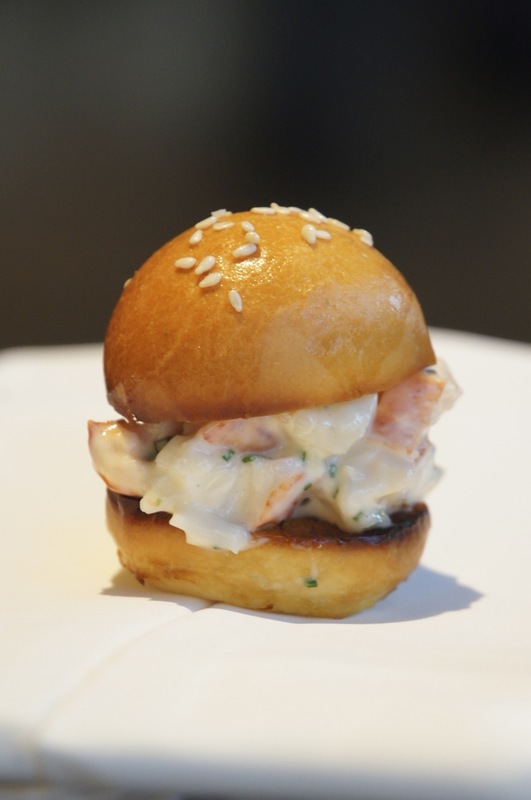 And then came a surprise, a little burger with bits of lobster in a cream and herb sauce. 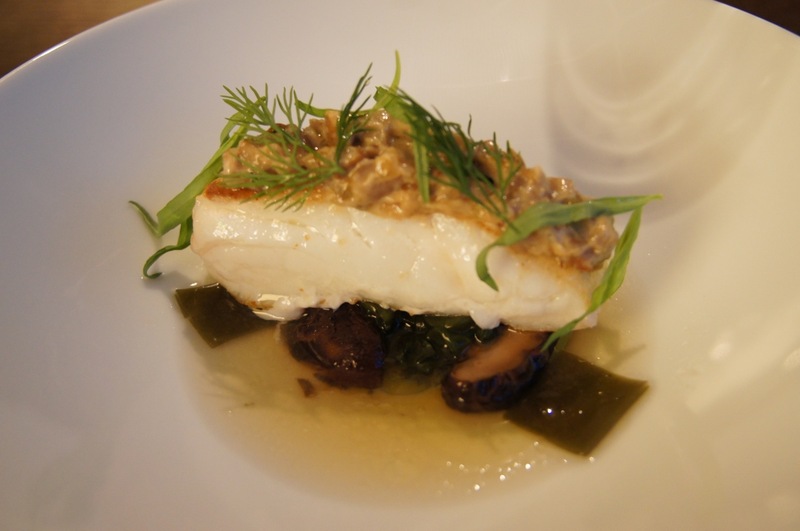 “Wilderness” was a roasted cod with wild mushroom broth and tarragon. A pan fried piece of cod was placed on a bed of shitake and seaweed with tarragon sprinkled on the cod. Not my favourites the fish was not my liking, but the broth was tasty. 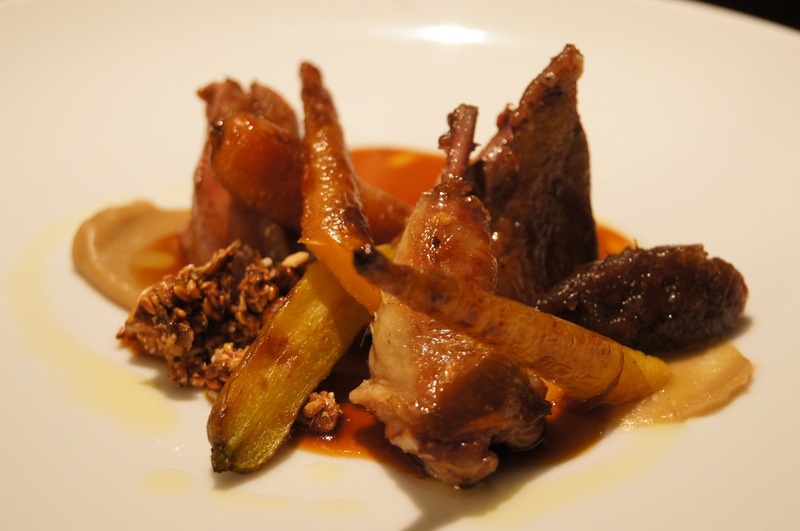 “Edible Soil” was a squab pigeon breast, confit leg, heritage carrots, shallot petals and thyme flower. The carrots were roasted until caramelised, so were the shallots. You have pan fried pieces of pigeon breast done medium, and a well-fried leg of the pigeon. Delicious. Next came the desserts. 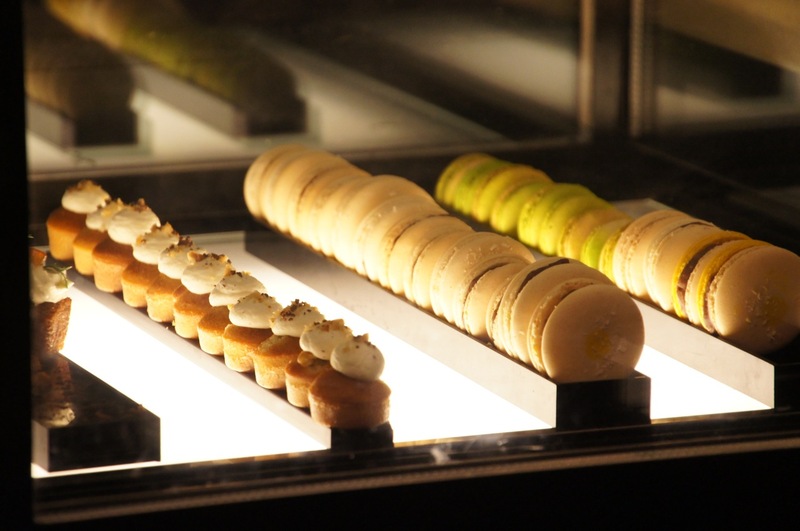 We adjourned to the dessert bar counter, where you can see how these desserts were assembled. First up, “Nuances of Red” which was a hibiscus and yogurt ice cream with pickled raspberries and orchids. I have never eaten hibiscus before, so I would not know how to tell if this was exactly what it should be, and neither have I eaten orchids. But it sure tasted like rose syrup and bandung when the yogurt melted. The next dessert was “Chocolate Kopi”. I took 2 shots of this dessert, one to show the perspective of size of the portion, and then the intricate details of the plating of this dessert. 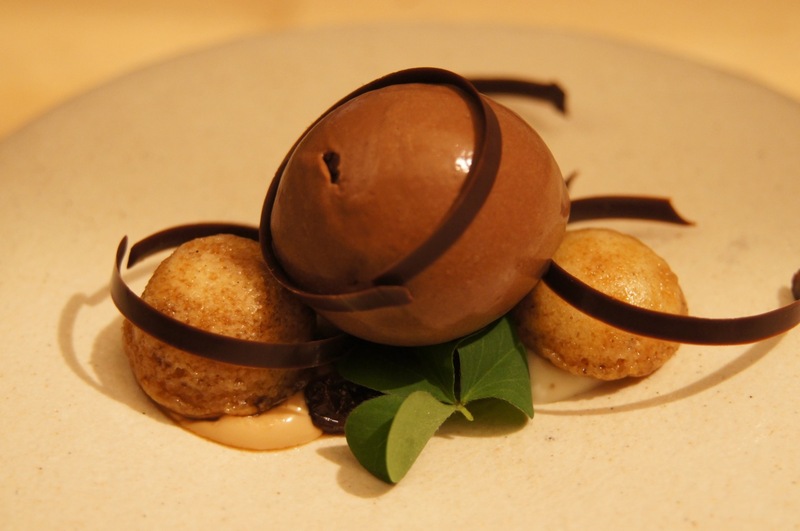 Simply it was a chocolate flavoured ice cream with 2 halves of a coffee macaron with chocolate shavings. The size of the chocolate ice cream was more like a truffle. We had one more a la carte dessert, which was their signature Pollen Tatin. Verjus, creme fraiche, caramel, red and green apple. Let me deconstruct this for you. The juliennes are apples. The fresh cream was on the bottom of the plate. The light veil was caramel. 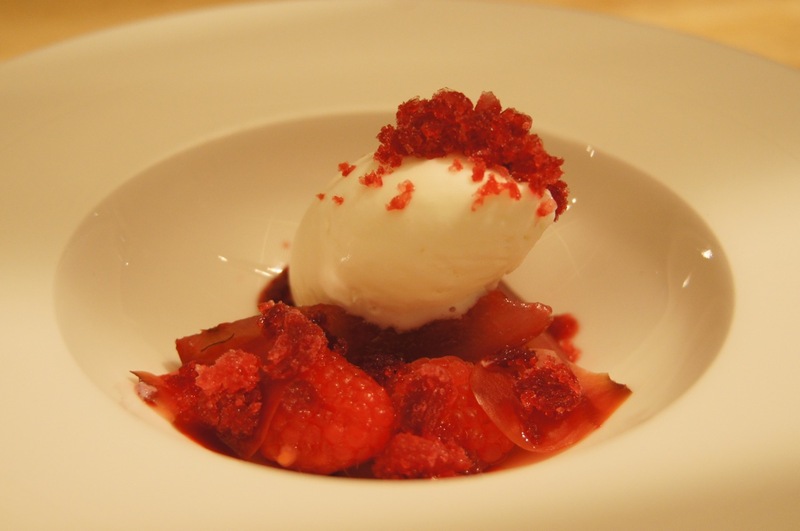 Verjus was the sour taste of the sorbet. 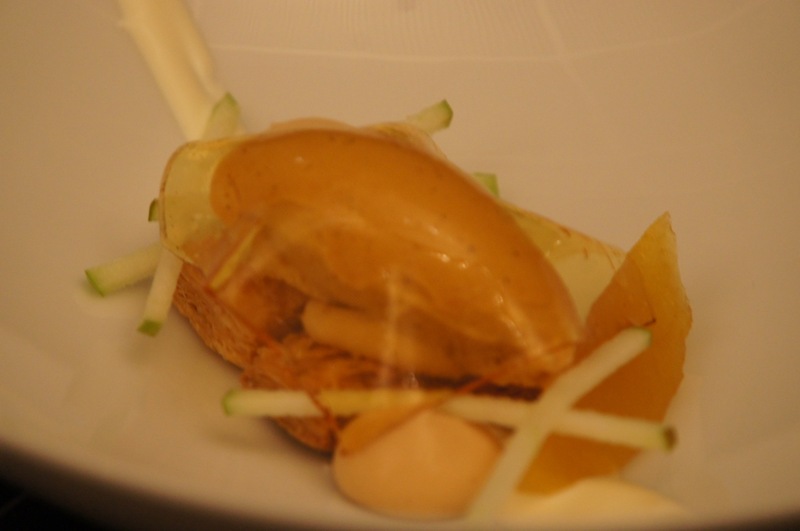 There you have it, citrusy sour sorbet with cream and apple. The apple were cut with German precision, not a strand was longer or shorter. 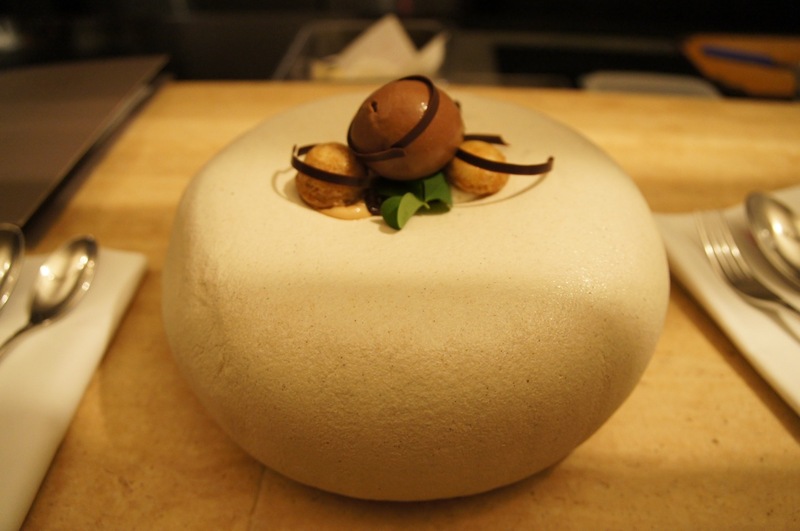 In fact all their desserts were constructed with military precision that came with El Bulli training. The main entrance was hidden behind the dome, and the Bistro can only be accessed from inside the dome. 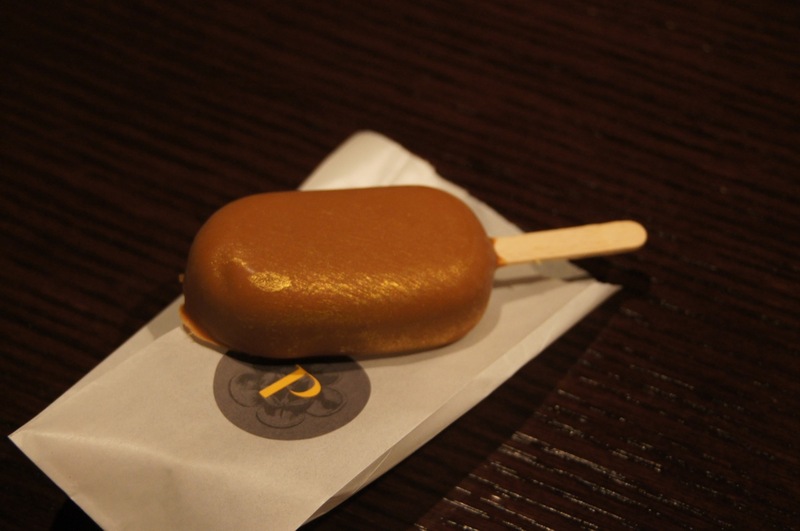 At the end of the dinner you can enjoy a lovely stroll in the park, and enjoy the magnum bar, complements of the restaurant. 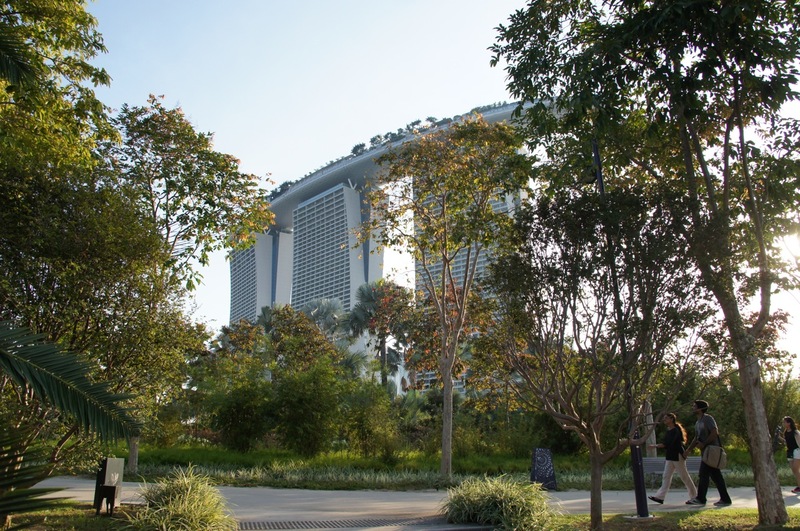 Then the shuttle either takes you to the front gate or MBS Tower 1. Great night out to impress your date. 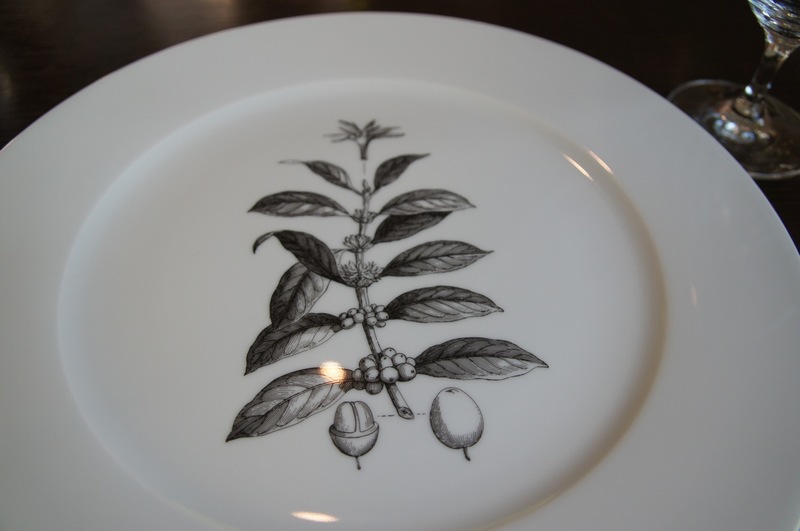 Food was delicately plated, but was very subtle in taste. Service was fantastic, so was the atmosphere. Child friendly, but no child menu though. Recommended for special occasions.